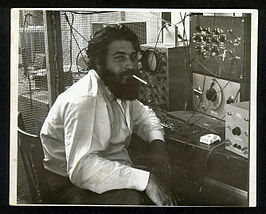 Jerome Ysroael Lettvin (February 23, 1920 – April 23, 2011), often known as Jerry Lettvin, was an American cognitive scientist, and Professor of Electrical and Bioengineering and Communications Physiology at the Massachusetts Institute of Technology (MIT). 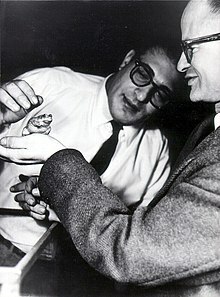 He is best known as the lead author of the paper, "What the Frog's Eye Tells the Frog's Brain" (1959), one of the most cited papers in the Science Citation Index. He wrote it along with Humberto Maturana, Warren McCulloch and Walter Pitts, and in the paper they gave special thanks and mention to Oliver Selfridge at MIT. Lettvin carried out neurophysiological studies in the spinal cord, made the first demonstration of "feature detectors" in the visual system, and studied information processing in the terminal branches of single axons. Around 1969, he originated the term "grandmother cell" to illustrate the logical inconsistency of the concept. Lettvin was also the author of many published articles on subjects varying from neurology and physiology to philosophy and politics. Among his many activities at MIT, he served as one of the first directors of the Concourse Program, and, along with his wife Maggie, was a houseparent of the Bexley dorm. Lettvin was born February 23, 1920 in Chicago, the eldest of four children (including the pianist Theodore Lettvin) of Solomon and Fanny Lettvin, Jewish immigrants from Ukraine. After training as a neurologist and psychiatrist at the University of Illinois (BS, MD 1943), he practiced medicine during the Battle of the Bulge. After the war, he continued practicing neurology and researching nervous systems, partly at Boston City Hospital, and then at MIT with Walter Pitts and Warren McCulloch under Norbert Wiener. Lettvin considered any experiment a failure from which the experimental animal does not recover to a comfortable happy life. He was one of the very few neurophysiologists who successfully recorded pulses from unmyelinated vertebrate axons. His main approach to scientific observation seems to have been reductio ad absurdum, finding the least observation that contradicts a key assumption in the proposed theory. This led to some unusual experiments. In the paper "What the Frog's Eye Tells the Frog's Brain", he took a major risk by proposing feature detectors in the retina. When he presented this paper at a conference, he was laughed off the stage by his peers, yet for the next ten years it was the single most cited scientific paper. For Lettvin, a corollary to finding contradictions was taking risks: the bigger the risk, the likelier a new finding. Robert Provine quotes him as asking, "If it does not change everything, why waste your time doing the study?" Lettvin made a careful study of the work of Leibniz, discovering that he had constructed a mechanical computer in the late 17th century. Lettvin is also known for his friendship with, and encouragement of, the genius cognitive scientist and logician Walter Pitts, a polymath who first showed the relationship between the philosophy of Leibniz and universal computing in "A Logical Calculus of Ideas Immanent in Nervous Activity," a seminal paper Pitts co-authored with Warren McCulloch. Lettvin continued to research the properties of nervous systems throughout his life, culminating in his study of ion dynamics in axon cytoskeleton. Lettvin in his Faraday cage in Building 20 at MIT in 1952. Lettvin was a firm advocate of individual rights and heterogeneous society. His father nurtured these views with ideas from Kropotkin's book Mutual Aid. Lettvin became an expert witness in trials in both the United States and in Israel, always on behalf of individual rights. During the anti-war demonstrations of the 1960s, Lettvin helped to negotiate agreements between police and protesters, and in 1968 he took part in the student takeover of the MIT Student Center in support of an AWOL soldier. He deplored the making of laws based on false science and false statistics, and the distortion of observations for political or economic advantage. When the American Academy of Arts and Sciences withdrew its award of the annual Emerson-Thoreau medal from Ezra Pound because of his vocal support for Italian Fascism, Lettvin resigned from the Academy and wrote in his resignation letter: "It is not art that concerns you but politics, not taste but special interest, not excellence but propriety." On May 3, 1967, in the Kresge Auditorium at MIT, Lettvin debated with Timothy Leary about the merits and dangers of LSD. Leary took the position that LSD is a beneficial tool in exploring consciousness. Lettvin took the position that LSD is a dangerous molecule that should not be used. Lettvin was a regular invitee at the Ig Nobel Prize ceremony as "the world's smartest man," and debated extemporaneously against groups of people on their own subjects of expertise. Lettvin married his wife, Maggie in 1947. They had three children: David, Ruth, and Jonathan. Lettvin died on April 23, 2011, in Hingham, Massachusetts at the age of 91. ^ "We are particularly grateful to O. G. Selfridge, whose experiments with mechanical recognizers of pattern helped drive us to this work and whose criticism in part shaped its course." ^ Burtoff, Barbara (December 27, 1978). "Just a Simple Brunch for 120 College Men". The New York Times. Retrieved May 23, 2017. ^ Squire, Larry R., The History of Neuroscience in Autobiography, Volume 2, Society for Neuroscience, 1998. Cf. pp. 223-243 on Jerome Lettvin. ^ Reinhold, Robert (1972-07-05). "Ezra Pound Is Focus of New Dispute". The New York Times. ISSN 0362-4331. Retrieved 2018-02-01. "Jerome Lettvin," The History of Neuroscience in Autobiography Volume 2, ed. Larry R. Squire (New York: Academic Press, 1998), 224-243. "Jerome Lettvin, Poet, Psychiatrist, Electrical Engineer, Neurophysiologist", The Learning Project; interview by Lincoln Stoller, May 2, 2007.